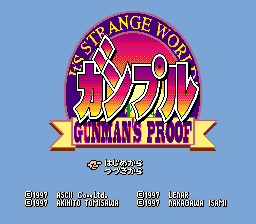 Ganpuru: Gunman’s Proof is an action role playing game for the Super Nintendo. Imagine Link to the Past, with all the puzzles taken out, and instead you’re given a bow with infinite arrows. Oh, and all the enemies shoot at you. Now you have Gunman’s Proof. 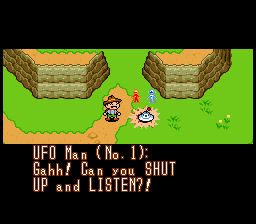 You’re a boy in the Old West who willingly becomes possessed by an alien sheriff with the intention of capturing the evil Demi, another alien who probably did some unspeakable atrocities. 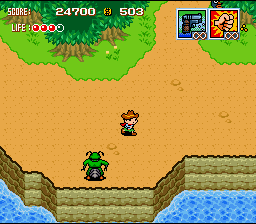 You live in the only town, in the center of the island, and go through a bunch of sequential dungeons before going through the last dungeon and taking Demi down. There’s some nice additions to the gameplay, like being able to duck under the bullets that are being shot at you and shooting diagonally. 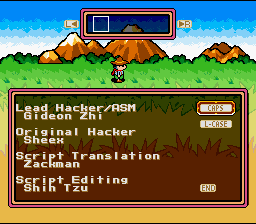 This is one of the few translated scripts to have been graced by the editing hand of Shih Tzu, and the end result is absolutely gorgeous. Regardless of your feelings towards the game itself, the translation is nothing short of remarkable. Oh, Gideon Zhi and Zackman did a good job too. Definitely. 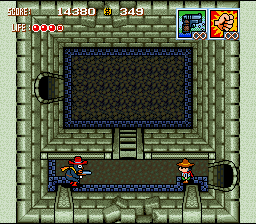 Anyways, the translation is complete and you should have no problems with playing it. Kay?